There was me, that is Iko, and my convict droogs, rescued from our prison transport by a Human ship captained by quite the hardened devotchka. But soon, I viddied a holographic doctor putting some manner of Borg technology in me gulliver. You can imagine the surprise, O my brothers and only friends, when I found that all me desire for tolchocking and the like had vanished. I was cured all right… but doomed nonetheless to snuff it. - Jeff Kober (Iko) also played Traeg in the Star Trek: Enterprise episode "Shadows of P'Jem". - F.J. Rio (Joleg) previously played Enrique Muniz in the Star Trek: Deep Space Nine episodes "Starship Down", "Hard Time", and "The Ship". He also played the Vissian chief engineer in ENT: "Cogenitor". "Some of the crew may not be comfortable helping to deliver eight men to their deaths." "I can't say I like it either, but we have a Prime Directive to follow." "You're not afraid of me." "There's no reason to fear someone in your condition." "You were never afraid of me, not even when I tried to kill you. It's nice to look into someone's eyes and not see fear." "You may experience unusual sensations while your matrix realigns." "I was referring to the arrangement the captain made with the Nygeans. No matter how terrible the crimes these men committed, it seems wrong to hand them over to be executed. This is a Federation starship, not the Barge of the Dead." "Would you prefer the captain released them?" "Of course not. They are dangerous men." "Execution ensures they won't pose a threat to anyone again." "So would life sentences, the operative word being "life". "Killing is wrong. No matter who's doing it." I may be misremembering, but I seem to recall that the death penalty was one of those debates that was at a high level of U.S. public consciousness around those innocent pre-9/11 turn-of-the-millennium days. If I'm right, kudos to the show for taking a pretty serious and outspoken stab at it. While they didn't quite fully plumb some of the depths they introduced (such as the tricky philosophical area of medically "repairing" somebody's conscience), and while some of the late plot developments were pretty predictable, it's far from the worst example of Trek taking on morality (far even from the last one), and the solid guest star roster helps. I also liked the jail set. And it struck me that Ethan Phillips brought his A game to some "meh"-level material. We might remember Jeff Kober from his very memorable one-shot villain on Buffy: the guy who got Willow hooked on narco-magic or whatever. I think that this episode may have been prompted at least in part by the movie of Dead Man Walking, based on Sister Helen Prejean's book of the same name. Sometimes these "whatever the writer just watched IN SPAAAAACE" things don't really work that well--see my comments on DS9's "Honor Among Thieves"--but I think that this was a decent-enough Trekkification of the inspiration; even the dubiousness of the miracle sociopathy cure can be handwaved by a combination of Borg nanoprobes being an enhancement to the already-impressive space-magical Federation medicine*, and the idea (going back to TOS) that they've cured many forms of mental illness already. Regardless, it was good to see F.J. Rio again, and I think that Kober did a great job with a subtle transition from a genuinely scary guy to a genuinely sympathetic one. Admiral One: So, what sort of hologram is this? Admiral Two: An Emergency Medical Hologram Mark I.
A1: Are there any more like him? A1: But what? Spit it out, man! A2: They're, uh, being used as mining bots. A1: [long pause] Mining bots. A1: Stone the motherfucking crows. Particle of the Week: Borg nanoprobes again. As we approach the end of the series, I guess the real question about this category will be: will Borg nanoprobes be the MVP, or photons? Pointless STO Comparison of the Week: The MMO features a few jails with physical doors instead of force fields, although the most notable example is staffed by holographic guards and therefore still susceptible to computer or mechanical failure. * Maximum Possible Photon Torpedoes: -21. Previously, on Star Trek Voyager, we had a decent stab at a social critique... until the ending, where the white guy talked sense into his overreacting biracial wife, and the discussion sort of disappeared in a vapid puff of nothing. This didn't really go any better. In the A-plot, the discussion is massively oversimplified by making crime literally the result of organic damage in Iko's brain, cured via Borg tech. (Gotta be the first time Borg nanoprobes made someone more ethical, for that matter.) The problem isn't that society denied him opportunities, or that he made poor choices, or anything else: Iko shouldn't be punished because he was literally sick, meaning that his discussion does not map onto the other criminals - this point is lampshaded in the ending, where the other notable prisoner tries to pull the same gambit with Neelix. This is... not a good way to approach that topic. They needed to at least attempt some nuance there to make any such discussion stick. The B-plot was legit infuriating, because it raises a real, significant problem and then just wraps it up with 'oh but the guy was a dirtbag taking advantage of Neelix all along,' letting everybody off the hook for the (apparently quite real) systemic abuse of that species. So I was disappointed in the way the A-plot constrained the (important) discussion of the death penalty, and downright upset with the B-plot. Anyway... yeah. They should pretty much get back to lighter stuff, or more meta/self-referential things that they know anything about. Oh, should've previewed: sorry, took some time to write that and so didn't see you addressing some of that above me, Jack. You articulated something I couldn't quite put my finger on, which is that familiar feeling of a way-too-tidy (in fact a so-tidy-it-ruins-the-rest-of-the-plot) ending. I never felt it as often with DS9, probably because (A) DS9 preferred the other extreme, the way-too-wide-open ending (how many times did an episode end with a tense music hook and some character saying something along the lines of "Who knows? "); and (B) since DS9 stayed in one place, they tended to not just introduce profound social problems in spaaace but explore them and deal with them. It feels plausible to me that they may have done the Menkaran stuff in this way as a clumsy hedge against the overall script seeming too pro-convict (or "pro-con" but that's confusing). Haha, pro-con's awesome. And yeah, I feel like they didn't really want to take any sort of stand, which makes the choice to talk about the issue in the first place pretty baffling. * Abuse of prisoners is bad, but abetting in the execution is okay because... reasons? * Some criminals are the result of medical issues, but some are just jerks. * Some victims are unreasonable, but not all of them. * Systemic abuse is real, but convicts gonna con. It felt very whattaboutist to me, which is why I'm inclined to believe they shouldn't have touched on this stuff. I'd rather have a story that was willing to commit to some sort of viewpoint. (B) since DS9 stayed in one place, they tended to not just introduce profound social problems in spaaace but explore them and deal with them. That brings to mind my second-favorite ending in Trek, probably. I did not remember ever seeing this episode, and was really intrigued by the premise of both the A and B plotlines. I liked that they were tackling the death penalty. I especially liked that this did so in a science fiction environment. Social commentary is one of the reasons why I watch and enjoy Star Trek shows. There were quite a few good things about this episode. The characters didn't seem like caricatures. That's a credit to their actors as well as the writing. Seven seemed like a good catalyst for the plot, although I must admit I'm now getting mighty weary of Borg Solutions Drive the Plot. Especially in this case because they felt like a partial deus ex machina. The storyline worked pretty well in the first three quarters of the show. (I especially liked the Doctor talking about the death penalty. I just got the feeling that the writers had good ideas but had written themselves into a corner. Which does happen, and sometimes that's okay. Not every episode has to be perfect. I guess I'd call this one an imperfect episode that tried hard to make a statement about two social issues and address them. If we were giving out marks. I'd give them some for that. I enjoyed watching it until the end. Of note: Tim DeZarn (he played Yediq) is another 'Hey, it's that guy!' character actor. He's had a long career playing minor supporting roles in all sorts of tv shows and movies. And he played the second in command Kazon (Haliz) who gets promoted in that second season episode you mention, mordax: Initiations. 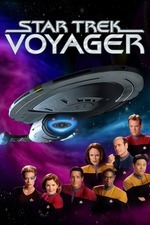 The thing is, Voyager's track record about race is just awful. It's not a case of 'some episodes were subpar,' it's more 'I no longer wish to throw a brick at the person writing these,' which is where I was in the B&B era. I disagree they wrote themselves into a corner, too. The place this episode goes seriously off the rails is the B-plot: if they had resisted the urge to make Neelix's friend a dirtbag and simply placed the ship in danger due to a stellar phenomenon (giving Iko a chance to behave heroically and put a bow on one of the two stories), they could've avoided the worst problem with their plot here. This wasn't inevitable, the way some of their worst stories were.